A collaboration between the National Oceanography Centre (NOC) and the University of Southampton is to develop an instrument capable of simulating the high pressures and low temperatures needed to create hydrate in sediment samples. Dr Angus Best of NOC and Professors Tim Leighton and Paul White from the University of Southampton's Institute of Sound and Vibration Research (ISVR) have been awarded a grant of £0,8 million by the Natural Environment Research Council (NERC) to investigate methods for assessing the volume of methane gas and gas hydrate locked in seafloor sediments. Dr Best, who is leading the project, explained: "Greenhouse gases, such as methane and carbon dioxide, are trapped in sediments beneath the seafloor on continental shelves and slopes around the world. Currently, there are only very broad estimates of the amount of seafloor methane and hydrate." The team plan a series of experiments on a range of sediment types, such as sand and mud. They intend to map out the acoustic and electrical properties of differing amounts of free methane gas and frozen solid methane hydrate. The laboratory-based approach adopted by the team will involve the development of a major new Acoustic Pulse Tube instrument at NOC. Using acoustic techniques and theories developed by the ISVR team, they aim to provide improved geophysical remote sensing capabilities for better quantification of seafloor gas and hydrate deposits in the ocean floor. 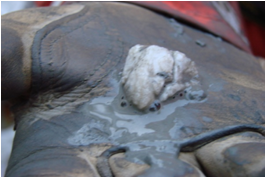 "Not much is known about the state of gas morphology – bubbles. Muddy sediments show crack-like bubbles, while sandy sediments show spherical bubbles. Only dedicated lab experiments can hope to unravel the complex interactions. By creating our own 'cores' of sediment material in a controlled environment where we know the concentrations of methane or carbon dioxide, we can create models to help us with in situ measurements on the seafloor." There is significant interest in sub-seafloor carbon-dioxide storage sites. Methane hydrates are a potential energy resource that could be exploited in future. They may also contribute to geo-hazards such as seafloor landslides – it is thought that earthquakes and the release of gas hydrates caused the largest-ever landslide, the Storegga Slide, around 8,000 years ago. Professor Leighton said: "The three of us have collaborated in recent years in an experiment that used acoustics to take preliminary measurements of gas in the muddy sediments revealed at low tide. Those measurements, and the acoustic theory we developed to interpret the data, provided exactly the foundation we needed to undertake this critically important study that will be relevant to the seabed in somewhat deeper waters. "As a greenhouse gas, methane is 20 times more potent per molecule than carbon dioxide. 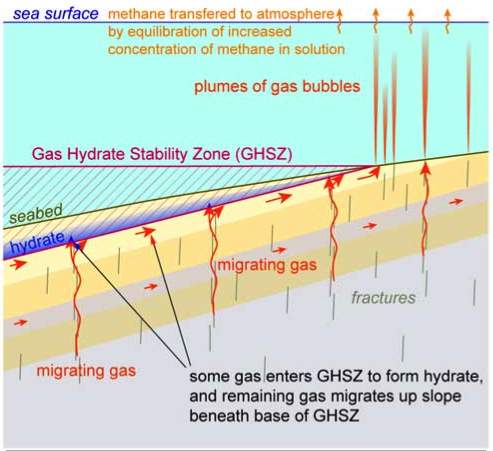 There is the potential for climate change to alter sea temperatures and cause more methane gas to be released from seabed hydrates into bubbles which reach the atmosphere. It is therefore vital that we have the tools to quantify and map the amount of methane that is down there."